OEL (Original English Language) manga come with low expectations in the minds of many readers â and who can blame them? Almost every OEL manga I have ever read has been completely awful, either due to bad writing by first-time creators or failed attempts to imitate the style of Japanese comics. Thankfully, Jason Thompson and Victor Hao's King of RPGs, while not exactly perfect, is a refreshing break from the sea of mediocrity that covers the OEL market. The series, written by manga expert and longtime translator Jason Thompson (Manga: The Complete Guide), drawn by newcomer Victor Hao, and published by Del Rey Manga, follows two college freshman and high school buddies: Shesh, a hot-headed former "World of Warfare" player, and Mike, a stereotypical anime fan with a penchant for dating sims and Japanese RPGs (role-playing games). They end up running into aspiring novelist Jen and "Mages and Monsters" Game Master Theodore, and before the pair knows it, they have been sucked into the worlds of tabletop role-playing, collectible card games (CCGs), and nearly every other odd hobby known to geek existence. Of course, it doesn't help that Shesh has an alternate personality that turns him into a psychopath whenever he role-plays. The clearest forefather of King of RPGs is, without a doubt, Fred Gallagher and Rodney Caston's hit webcomic series, Megatokyo. Its main characters were also a hot-headed gamer type and a wimpy otaku, though that series focused far more exclusively on its anime roots as it went along. On the other hand, what makes King of RPGs a joy to read for any geek is the wealth of hobbies that it covers (and the intentionally silly grandeur with which it covers them). Anime and video games are rather common hobbies, so Shesh and Mike are good anchors for newcomers to RPGs and CCGs, who will find tons of explanatory information in the dialogue. Unfortunately, when the explanation turns toward character motivations, Thompson's typically crisp and engaging writing can feel stiff and forced. There is even a series of panels that simply show thought bubbles from all four of the characters in the scene, establishing why each of them is playing Mages and Monsters. Thompson uses this sort of over-explanation throughout, and it frequently pulled me out of the story. Nevertheless, Thompson is hardly shy with his use of references, despite the necessity for covering up names like Dungeons and Dragons and Pokémon with similar constructions like "Mages and Monsters" and "Gothemon." Aided by some of Hao's great visual nods to anime, manga, and video games, Thompson makes allusions to everything from Death Note to Final Fantasy to Taxi Driver to Monopoly, and even throws in what I believe is a very subtle reference to former Alaska Governor Sarah Palin. Victor Hao reaches his best moments when his art stays within his own wacky-looking cartoon style. Many of the characters, most notably Shesh and Theo, are frequently portrayed with little dot eyes and gaping mouths, an American comic strip look that really seems to fit the story and allow for a number of surprisingly funny visual gags. However, the characters that are drawn in manga-style (typically women) end up looking like grotesque, poorly proportioned aliens. Such is the trap that most OEL manga artists fall into when attempting imitate a broadly defined cultural style rather than focus on their own unique aesthetic. To make matters worse, the comic seems to be a victim of a tragic screen tone explosion, leaving some of the pages cluttered and hard to understand on a first reading. 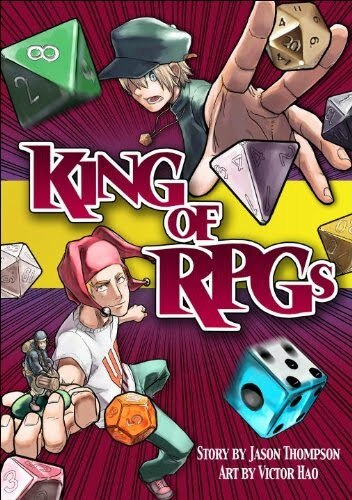 Despite some of its artistic shortcomings, King of RPGs really is a fantastic read. To be honest, I read this during a car ride with my family, and they were all very annoyed that I was laughing out loud literally every minute or so of the ride. That's about as good of a recommendation as any comedy can get. This review is based on a pre-release copy kindly provided by Scott VonSchilling after he reviewed it.